How did I come to be in all of the cultural margins in which I’ve served? My favorite answer to that question is: God’s great sense of humor. Another good answer is: by putting one foot in front of the other, moving incrementally in whatever direction seems right in the moment. And both of those answers are connected in a simile that pleases me: my professional journey has been like the walking of a meditational labyrinth. 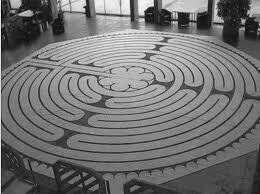 The kind of labyrinth I mean is a medieval design that seems confusing like a maze but is really a single path on which one can’t get lost. You can find them all over the world, but I have three favorites: one on the floor of Chartres Cathedral in France, and two (one indoors and one outdoors) at Grace Cathedral in San Francisco. Early on in a labyrinth walk it looks as if the center is near. But the next moment there is a U-turn that heads back toward the outer edge of the labyrinth; and when it begins to seem as if the center will never be reached, suddenly it is straight ahead, waiting. From supervising a suicide-prevention hotline in Grand Rapids, Michigan, to becoming a Certified Professional Guardian for the state of Washington; from cleaning toilets and changing diapers for people with Alzheimer’s Disease to becoming a nationally-certified hospital chaplain; from giving seated massages to street people under the viaducts of San Francisco to midwifing the deaths of hospice patients; from earning national certification as a massage therapist to serving as a Guardian ad Litem for the Superior Courts of four Washington counties, I have walked the hairpin turns of a labyrinthine career. As portions of the path presented themselves to me over the years, I kept putting one foot in front of the other. I wasn’t sure where the trail was leading, wondered often if I were terribly lost, then suddenly there I was, in awe of working in yet another kind of margin. And no matter where I pause along the way, almost always I can hear something that sounds like divine laughter, sometimes in a satisfied basso, sometimes in an ironic alto, and always with a rich timbre of delight and compassion. Oh, Cynthia! I just discovered your blog today and I LOVE what you have written, especially this one.